Right now we have about 5 days left before we move onto our boat. We have a slip in Beaufort through October 14th. After that we'll have to move to an anchorage. We have to come back to Raleigh to finish preparing the house for our departure, a birthday party for the girls on the 19th, and a wedding on the weekend of the 26th. Our planned departure is still early November, but there are still dozens of tasks remaining to be done on the boat once we get down there. For those interested, we are planning to leave via Bermuda and then the Virgin Islands. It should take 3-4 days to Bermuda, and 4-5 days to the Virgin Islands. Right now the big job is getting everything done here at home. We still have dozens of tasks left here at the house including: additions to our alarm system, cleaning out the refrigerator, pantry, packing everything we need for a year, yardwork arrangements, turning off unneeded services, paperwork with the state for taxes, health insurance details, etc., etc., etc., etc. And ONLY 5 DAYS LEFT! Back to work! We have been living on the boat for the most part during the last week. With trips back home to work on final details at home. Yesterday was the first time to really take the boat out for a sail since the haulout. It was a beautiful day with a good breeze and calm seas. We saw frolicking dolphins all day. Several jumped clear out of the water, and others were jumping and spinning. Frank thinks some were doing more than frolicking...;-). We practiced man overboard scenarios and were testing out the new props. Unfortunately, there is a problem with the props - they are not automatically going to neutral (no drag) as they were designed to. Frank snorkeled down and found out the props were very stiff. Consultation with another catamaran owner at our anchorage revealed he had heard another Autostream owner had the problem when too much grease was put in the props. This is very likely with ours as the guys Frank hired to install put all the grease they could into the props. Now Frank has to find out whether we'll have to haulout again in order to fix it. Sigh. When the props were in neutral properly, they worked quite well. The number of tasks left is starting to look practical. It will still be a bit hectic during the next few days as we finally move onto the boat permanently. Next week the other catamaran we're travelling with will be arriving, and we look forward to meeting them. The kids are doing home schooling right now - we're using Internet connections at the Beaufort library. In a little while we're going to Kinston to buy some fishing gear. Which reminds me, we left something on the boat we're going to have to go get before we leave! We finally have officially moved onto the boat for the trip! Everything at home has been taken care of (we hope). We are now doing final provisioning and preparations for the first passage from Beaufort, NC to Bermuda and then on to the Virgin Islands. The other catamaran we are waiting for was delayed by bad weather. So, we may not leave until after they get here (probably early next week). We're starting to wish we would leave on Friday because there appears to be an excellent weather window starting then. But, we also want to have some company, so we'll most likely wait. Besides, we probably won't have everything ready by Friday anyway. Homeschooling and Halloween costume making have been occupying the female component of our crew. Frank is doing the boat preparations and logistics with boat insurance and spares still being shipped. We're excited about going, but we're also going to miss all of you - our friends and relatives. Thanks for reading! The Taylor family has started the beginning of a year-long cruise to the Caribbean and the Mediterranean. We've sailed to Bermuda and recently completed our journey to the Virgin Islands. So our visit to the Caribbean has begun!. 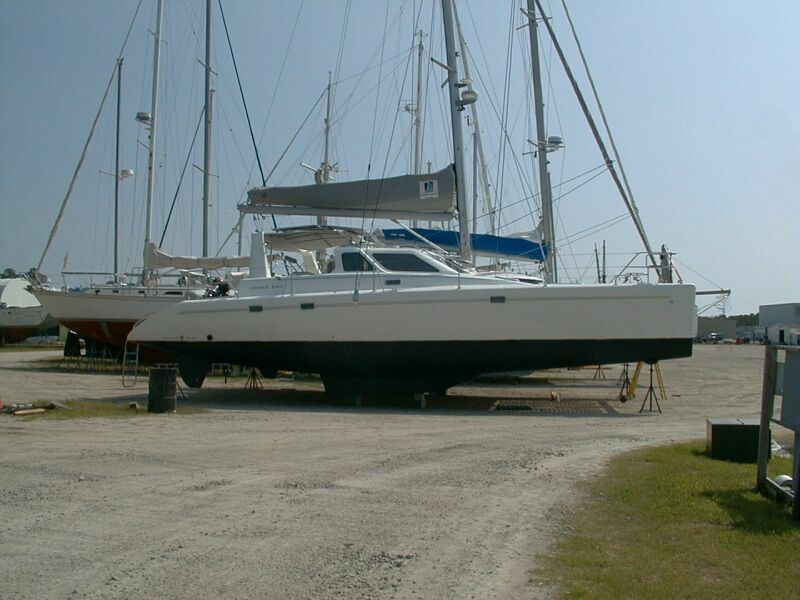 We had to wait to leave the U.S. until after the hurricane season (boat insurance says after November 1). We plan to spend six-seven months in Puerto Rico, the Virgin Islands, the Leeward Islands, and the Windward Islands of the Caribbean. By April we hope to be prepared for our first Trans-Atlantic crossing. After getting the right weather window, we'll depart and hopefully arrive in the Azores within two weeks (with a layover in Bermuda). We'll then cross to Portugal and begin our Mediterranean cruising. We plan to spend all next summer in the Mediterranean with stops at least in Greece, Italy, France, and Spain. We then return back next October/November to North Carolina via the Canary Islands, the Caribbean, Bahamas, and up the East Coast to home. We hope we'll make and meet lots of friends along the way, and will invite friends and families to spend a few days with us along the way. It is also our plan to use these web pages as a way to share our experiences along the way! Our original plan was to visit the East Caribbean for 6 months from November 2002 through until late April/early-May 2003 when we would leave and sail across the Atlantic to the Mediterranean for the summer and make our way back to the US via the Caribbean again in the fall of 2003. We recently completed going from North Carolina, to Bermuda, the Virgin Islands and down south and east through the East Caribbean chain all the way to Grenada. (Read all about our trip in the Cruising Log). Unfortunately, the world political climate has drastically changed in the last few weeks. The Iraq War has definitely put the spotlight on Americans, and this has forced us to reconsider our trip to the Mediterranean. We feel Americans travelling abroad on nice new sailboats may be somewhat visible targets of unknown intents. Travelling with children under these conditions just doesn't seem wise. It's truly unfortunate, as there will not be another opportunity we think to travel with our daughters under these conditions. They are growing into young ladies, who through no fault other than growing up, will probably not want to travel alone with their parents for a long journey until they are much older. So, we will postpone this venture indefinitely. Our new plan is to continue travelling in the Caribbean for another two months (through mid-June), then make our way back up through the Bahamas and home before the hurricane season really starts in July. So, we should be home in North Carolina by July.